Look What Is Happening with CMATD! See you at the New England Conference networking event Thursday! Our Partnership Director, Wendi Braun, is attending the conference and would love to say hello to our CMATD members. Please look for Wendi as you enter the networking hall around 7:00 pm. Interested in presenting at an upcoming meeting? We had a great time introducing ourselves to our members at Jimmy’s Tavern in Shrewsbury last month. There is still so much more we’d like to know about our members and information we wish to share. We’ll continue conversations in person at our future meetings but also online. So check our website regularly for information on upcoming events, blog series, and updates on LinkedIn and Twitter. Having influence at your organization enables trainers to be successful when rolling out their programs. 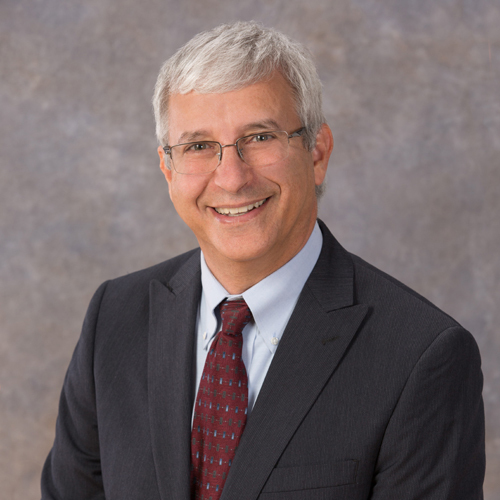 Hold April 17 to hear Eric Bloom share concepts, techniques and practices to help you raise your “Influence Power Rating”. Eric is a former CIO, #1 bestselling author on Amazon, a TEDx Speaker and the Executive Director of the IT Management and Leadership Institute, the governing body of the ITMLP and ITMLE certifications. He also provides specialized training on IT leadership, interpersonal communication and productivity skills. Registration details will be posted soon! Have You Thought About Becoming an ATD Power Member? When you join our local CMATD chapter and ATD National, you are choosing to be a knowledge leader in the talent development profession AND a learning leader in your own backyard. 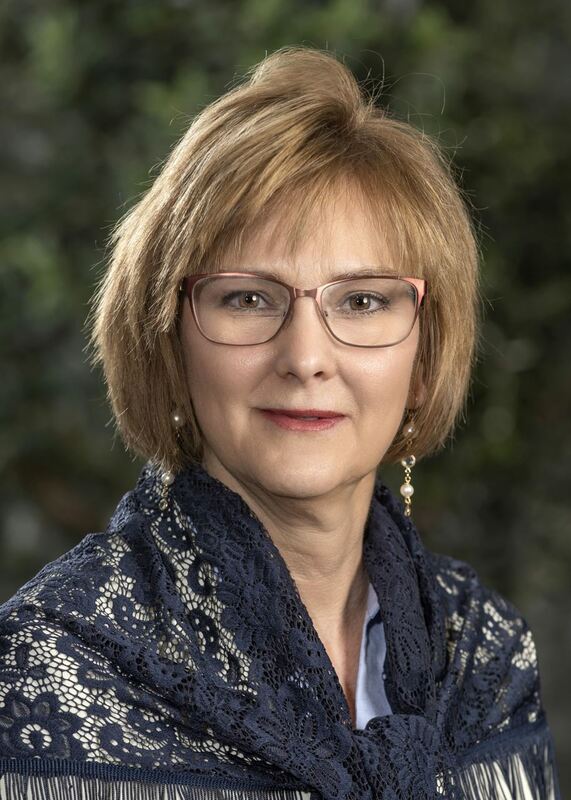 Joint membership offers learning professionals a unique opportunity to connect with local, national, and international professionals. Stay on top of the latest learning trends, and gain access to research and templates that can help in advancing your career! For more information please visit our website. Visit the ATD Educational Website to learn more about these courses. Make sure to use the Central Mass Chapter Chip code CH1201 which gives our local chapter credit when you register for programs. CMATD Meets ATD CARE Requirements for 2018! 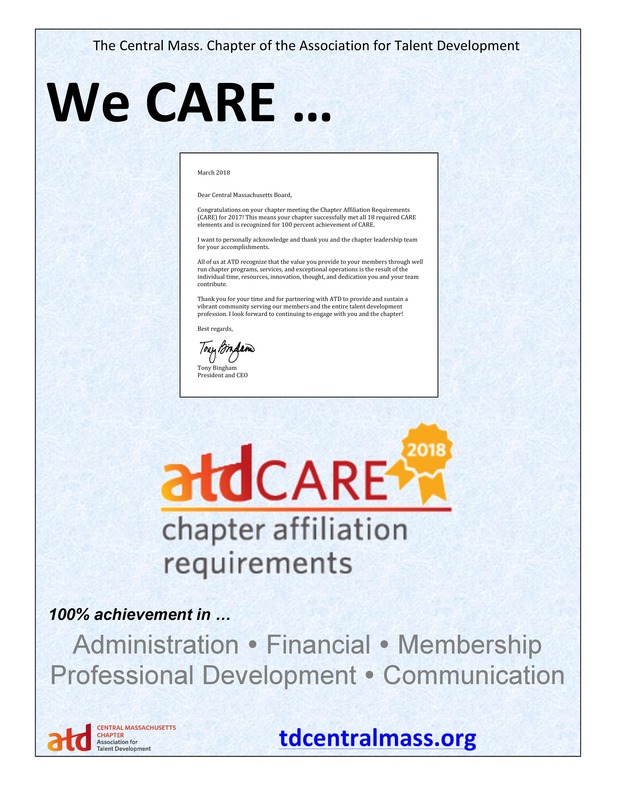 CMATD was notified by ATD that our chapter has met the 18 required elements for the Chapter Affiliation Requirements and is recognized for 100% achievement. In addition, the chapter was also recognized as a Chapter Membership Super Star because 50% of our members are both local and national members. The TD Professional book club is starting our third book on Friday February 8th so now is a great time share the resource with your community again. The program sign up page is here: https://www.pbc.guru/td/ . This is where people go to create their accounts and get started with the book club. The group officially starts our new book on February 8th as people will still have two months to complete the reading. Sign up for ATD 2019 by Feb 8 for Savings! Support Central Mass ATD and use our CHiP Code: 1201! We'll get a financial report directly to the chapter! ATD’s Talent Development Across Industries (TDI) conference - discount code below! ATD’s Talent Development Across Industries (TDI) conference is coming up in New Haven on October 18-19. There is a special discounted rate that has been extended to ATD chapter leaders and chapter members: by entering the coupon code 25TDI at checkout, you can receive 25% off the conference registration! Your chapter can also earn CHIP revenue for any TDI registrations when your ChIP code (1201)is entered at checkout. Please feel free to share the below blurb and attached flyer with your membership, and don’t hesitate to reach out with any questions. What are you doing to create compelling and effective compliance training? ATD’s Talent Development Across Industries (TDI) conference will address the challenges of creating impactful compliance training. This conference brings learning professionals from three highly regulated industries—financial services, manufacturing and life sciences—to learn best practices from each other and experts in their fields on compliance training and creating a culture of innovation. Chapter members receive an additional 25 percent off the member price—saving you more than $200! Join us at Yale School of Management on October 18 and 19 for TDI! As part of ATD Member Week, taking place September 10-14, you can receive a 10 percent discount on your ATD membership dues on top of the $30 discount that Power Members (members of both ATD and their local chapter) already receive. Join or renew your ATD membership online or by contacting ATD’s Customer Care team at 703.683.8100. Remember to select our chapter on the drop-down menu online during checkout or mention our chapter’s name over the phone to receive the Power Member rate. Our chapter is partnering with more than 40 ATD Chapters to create an online book club for L&D professionals around the country. 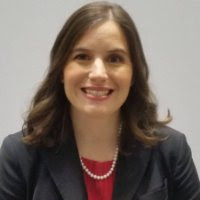 The group will connect virtually through an online forum to discuss books related to L&D, training, organizational development and much more. You can learn more and sign up for the book club here: https://www.pbc.guru/td/ . The program is completely free so feel free to pass the opportunity on to friends and colleagues.